Public baths have been a fixture of Japanese life since the mid-sixteenth century, when they were created to give ordinary people the opportunity to bathe. The number of public baths (sento) in Japan peaked in 1987 at about 17,000. Now that most people have bathtubs or showers in their own homes, however, public baths are a less common sight; only about 6,300 now remain. Recently these baths have been enjoying something of a revival, appearing in books, photographs, movies, and even plays. From the outside, a Japanese public bath building looks like a shrine building. Inside, the space is divided into a men's side and a women's side, each with their own changing room and bathing area. Part of the bathing area is taken up by rows of faucets, and the rest of the space is occupied by a tub or tubs of steaming water large enough for several people to bathe in at once. People use the faucets to soap, scrub, and rinse their bodies before moving on to the tub for a relaxing soak. Some bathing areas are large enough to be used by 20 to 30 people at the same time. In bygone days, the changing room was a cozy wood-floored space where neighbors exchanged gossip and idle chitchat while they dried off after their baths. 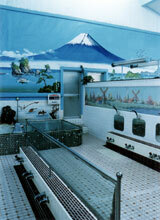 At every sento, the wall behind the hot tub is painted with a mural of Mt. Fuji or some other famous Japanese scenery, which bathers can gaze at while they warm themselves in the tub. Although sento are disappearing from the Japanese landscape, they have recently been experiencing a revival thanks to this art. In March of this year, an exhibition of sento murals, titled "Bath Art: Scenes from the Sento," was held in Tokyo at the Mitaka City Arts Center. The exhibition included both works by sento muralists (of whom there are said to be only three remaining in Tokyo) and "sento-style paintings" created by six young artists. To Japanese people, who usually view sento murals while bathing naked, this may be the most intimately familiar art form of all. Public-bath patrons in Tokyo are currently getting a visual treat in the form of a poster titled Sento e Iko ("Let's Go to the Sento"), created by well-known artist Tadanori Yokoo and planned and produced by the Tokyo Sento Association (site is Japanese only). This colorful poster, executed in the traditional mural style, can be seen only in public baths in Tokyo, typically on the changing-room wall. The sento also plays a supporting role in a new movie scheduled for release this fall. The film, Mizu no Onna ("Woman of Water"), in which the main character is the only daughter at a small family-operated sento in Osaka, portrays a happy modern-day nuclear family against the backdrop of the traditional Japanese public bath. Bath houses have also featured in live theatrical productions. In April the Piccolo theatrical troupe, based in Hyogo Prefecture, gave an impromptu performance of Tatsukichi no Yu ("Tatsukichi's Hot Water"), a nostalgic human comedy featuring sento murals. And sento are appearing in books, too. Sento no Megami ("The Goddess of the Sento") written by Hiromi Hoshino, a photographer and nonfiction author, was published early this year. Hoshino describes the sento as a cultural venue unlike any other in modern-day life - a place where human beings are naked in a communal setting and show consideration for others; a place that has no use for either fashion or cell phones. Meanwhile, a book of photographs of Japan's remaining sento, edited by Shinobu Machida, a scholar of popular culture, came out in April. Japan has more than a few public baths that are excellent in terms of architectural design, and those involved in producing the photo collection hope that the book will spur a movement to preserve some of these unique architectural treasures. Machida, who calls himself a sento scholar, published another book at the end of last year. Titled Sento no Nazo ("Mysteries of the Sento"), it is a collection of miscellaneous facts about Japanese public baths. The book represents the culmination of a 20-year labor in which the author visited 2,000 sento around the country to find out everything about the buildings, right down to how the chimneys are cleaned. There is an ongoing movement to stem the tide of sento closings in Japan. Under a plan conceived by an alliance of public bath operators in Tokyo's old downtown district, at least one sento has set up a stage in its changing rooms for performances by young rakugo artists and has become a popular place again with the help of the humorous storytelling performances. Another sento has augmented its facilities with an Internet cafe, enticing customers to linger after their baths and enjoy some refreshments while they log on. There are also giant sento where customers can enjoy reflexology or watch videos on a big screen. Some sento boast food and drink menus comparable to those offered by restaurants or izakaya (Japanese-style taverns or pubs). All of these innovations bespeak sento operators' dreams of preserving the institution of the Japanese public bath - a dream that arises not from mere nostalgia but from the urge to revitalize their communities.